Saiyans (Saiya-jins) are an extraordinary, barbarous and powerful race. (Note: In Japanese, "jin" means people; so that means that saiya-jin are "Saiya people") Their sole purpose in life was to fight and survive. At the beginning of the Dragonball series, we learn that they lived on Planet Plant. They shared this planet with a race called tsufuru-jin. The tsufuru-jins were an advanced race with many cities and highly advanced technology. Their technology allowed them to fight against the naturally strong saiyans. The saiyans were strong savages who lived in wastelands attacking the tsufuru-jins at times. Because the saiyans had the natural ability of fighting using their bare hands, they were a force to be reckoned on. Fortunately for the tsufuru-jins, they were able to defend their planet with their technologies. 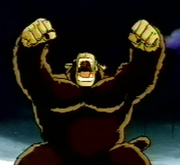 Then, one night on the full moon, all the saiyans who had been exposed to the light of the full moon, underwent the change into Oozaru (Giant Ape) and easily crushed the tsufuru-jins out of existence. From then on the planet was called Planet Vegeta. The saiyans used some of the tsufuru-jin technology to become the strongest race in the universe. The strongest being in the universe, Freeza, an evil creature, used the saiyans as mercenaries to take over planets for him and sell them. One day, the saiyans got tired of working for Freeza, so the king, King Vegeta, revolted with several of his loyal men. Unfortunately, he was killed along with his men. Freeza then destroyed Planet Vegeta in one giant blast, along with the entire saiyan race. Only a few saiyans survived, including Kakarot (Goku), Prince Vegeta, Radditz, Nappa, Taurus, Paragus and Brolli. This is the typical appearance of a saiyan. 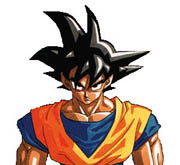 A normal saiyan has black hair, a thick, strong, muscular body, and a unique tail. Saiyans have the excellent natural fighting ability that causes them to consume a great amount of calories daily. In order to provide these calories, they eat a lot. Goku, a low-class saiyan, consumes about 10 times the appetite a normal human would eat daily. Compared to humans, saiyans are extremely strong. Even when hit by Bulma's car in the beginning of the Dragonball series, Goku was not hurt. He immediately stood up after he was hit. Freeza's worst fear... the Super Saiyan. This level is a legend early in Dragonball Z, but eventually becomes a natural form. Goku is the second person to ever reach this level, but is the first one we ever see doing it. 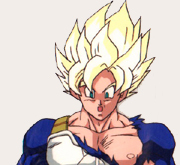 When reaching this level the Saiyan's hair turns yellow, the eye's turn green, and his power level rises greatly. The Legendary SSJ mentioned throughout the series is Brolli. Super Saiyan are supposed to be ruthless killing machines, but we see that the Saiyan's personality barely changes after the transformation. The Super Saiyan level is triggered by emotional rage (usually). Someone with a pure heart of good or evil can only reach it. 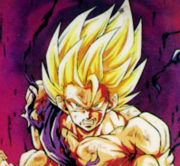 Once reached the status of super saiyan, the Saiyan can go SSJ at will. Gohan first reached this stage while fighting Evil Cell in the Cell Game. This stage is very much like the first Super Saiyan stage, but of course much stronger. Occasionally, the Saiyan who is in this form has electricity going around his body and through it. That's how you can tell the difference between SSJ and SSJ2. 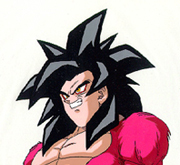 Also a Saiyan level 2 has slightly longer hair. This level is more superior than ssj level 1 in terms of strength and speed. It is also triggered by extreme rage. Goku is the first and only person besides Gotenks to reach this stage. It is one of the strongest forms in all of Dragonball. You can tell a Saiyan is SSJ 3 when they have gold hair like all the other forms before it, and their hair gets really long and full. Also, the Saiyan's eyebrows disappear. This level is only achieved through training. After training in Heaven during the period of time after the Cell saga, Goku learned how to transform to ssj3. This form brings more power and speed, but because it uses more energy, a saiyan can only stay in this form for a short period of time. This stage was made by TOEI Animation and was nothing to do with the original author of Dragonball, Akira Toriyama. 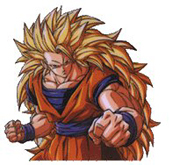 During this stage the Saiyan's tail grows back. Their eyes turn yellow with a red outline around the eyes. The palm contains a hole that can absorb energy. Their back and most of their body is covered with red fur. The hair stays black, but gets long, not as long as SSJ 3. And again the Saiyan gets unbelievably powerful. Goku is the only real person to reach this level, but Bulma creates a device that turns Vegeta into a SSJ 4 also. This form is triggered by extreme rage, anger and sorrow. When a Saiyan with a tail is exposed to pure moonlight (from any moon) he turns into a gigantic 20-foot tall, ape-like creature. 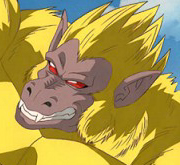 The Saiyan's power level is increased ten times when turning Oozaru (Oozaru is the Japanese word for "Big Monkey") Saiyan's used this form to take over planets for Freeza. This form is possibly the most powerful form under SSJ level 3. All saiyans, except Goku and Gohan were able to control themselves during this form. This stage is much like the regular Oozaru stage except that the fur is golden not brown and it's of course much stronger. This is also made by TOEI. To reach this stage a Saiyan must have a tail and must receive more waves from the moonlight. The only ones to ever reach this stage were Goku and Bebi Vegeta during Dragonball GT. Vegeta reached it while Baby was inside of him and attacked his friends. Goku eventually defeated him. Those who achieved this form: Goku and Bedi-Vegeta.